Tiradores infantiles, bolas de madera, cajas de madera, complementos para el hogar, mobiliario infantil, mobiliario y decoración son solo algunas de las gamas de productos que podemos ofrecerte en Mabaonline. Entra a nuestra tienda y descúbre porque somos los números 1 en venta online de artículos en madera! Ball handle manufactured in beech wood with a 20 mm ball diameter and peg. 30 mm ball handle manufactured in pine, beech woods and lacquered white, with inlaid nut for bolt, bolts included. Ball handle manufactured in beech wood with a 40 mm. or 50 mm. ball diameter and peg. Knob handle with 30 mm diameter profile Ref. 6 manufactured in beech, pine, oak woods, varnished and lacquered in white and black, with inlaid nut for bolt, bolts included. Knob handle manufactured in pine wood, available in two sizes of 25 mm and 30 mm with inlaid nut for bolt. 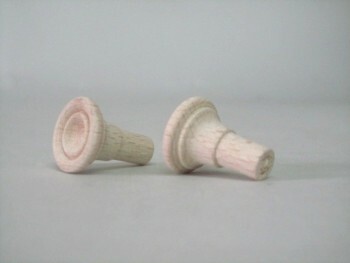 Knob handle manufactured in pine wood of 45 mm. with inlaid nut for bolt, also available in lacquered White. Hollowed handle with shape manufactured in beech wood, available in two sizes of 30 mm and 40 mm with inlaid nut for bolt. Handle made of beech wood with diameter of 20 mm. Overall length 25 mm. Pull handle made ​​of beech wood 40 mm. with countersunk screw nut, also available in white lacquer, * includes screws. Turning handle made of beech wood 10 mm. dtro. with spike. Total length of the handle 15 mm. Handle made in beech 25 mm. with countersunk screw nut. Total length of the handle 20 mm. * includes screws. Mushroom-shaped handle made of beech wood with diameter of 45 mm. total length 50 mm. Round white lacquered handle with screw nut. Size 5cm. dtro. thickness 8 mm. Emptying shooter made in beech. We have 2 Big and Small measures Large: 50 mm overall diameter. 50 mm long. pin 18 mm. Small: 28 mm overall diameter. 35 mm long. pin 10 mm. Handle with profile made of beech wood with spike shape small mushroom. Overall dimensions Ø 30 mm. length 25 mm. Measures of the long tenon. Ø 10 mm. Monday-Friday from 9h a 15h. Contact us through our contact form. Call us to 916 581 464 customer service from Monday to Friday from 9 a.m. to 3 p.m.